Hello and welcome to the first tutorial of Galumph! Galumph is a 2d drawing tool at its core, but its intended use is to make 3d assets, quick and dirty, without any prior 3d modeling knowledge. If the idea of drawing in two dimensions to obtain a 3d model is confusing, I don't blame you! Luckily this tutorial is here to try and get some of that confusion away. Lets dive straight in to look at the core tools involved in making a 3d sketch possible. 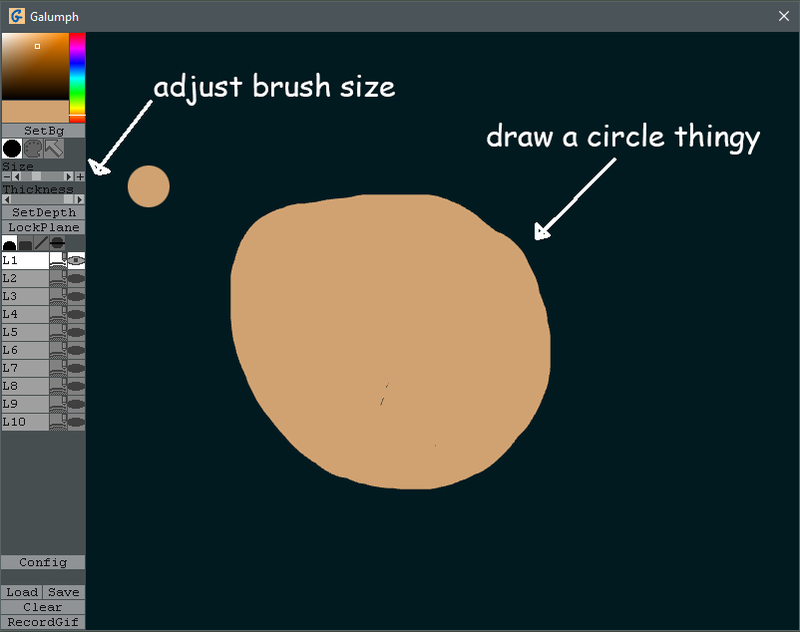 Increase the brush size as shown in the picture. 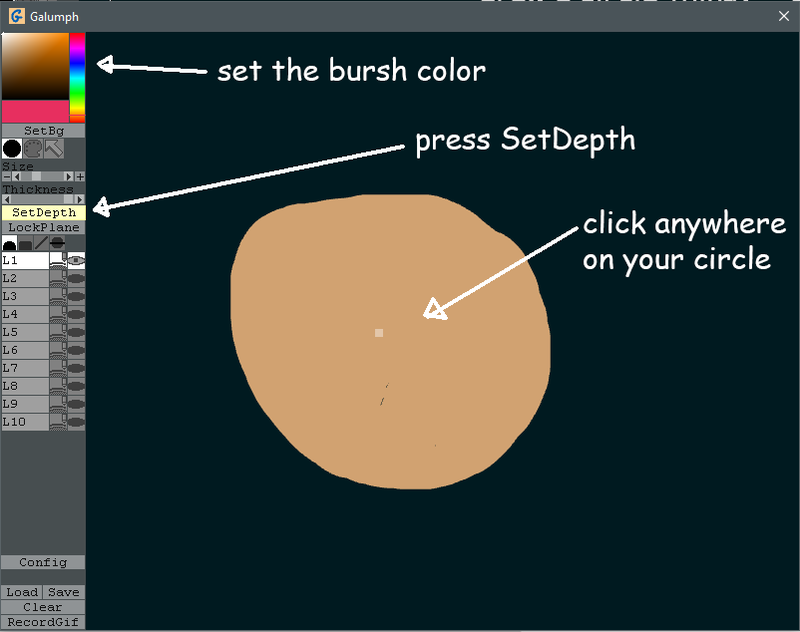 Then hit the viewport with your left mouse button like you mean it and draw a circle. Fill it with as many strokes as you wish, we just want a circle-ish thingy without too many holes. That circle is about to become a 3d face, brace yourself. 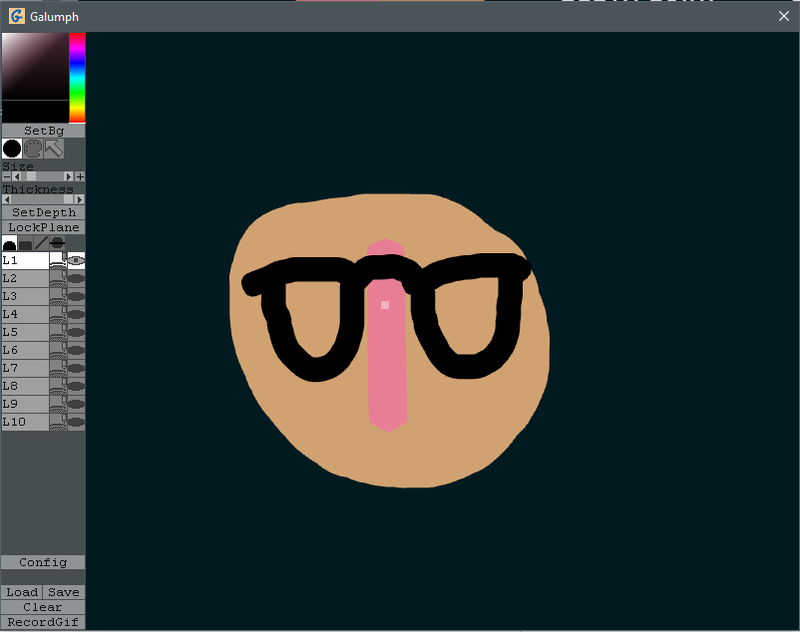 Change the color of your brush to something we'll use to draw a nose, color picker is on the top left corner. Then click on the SetDepth button. 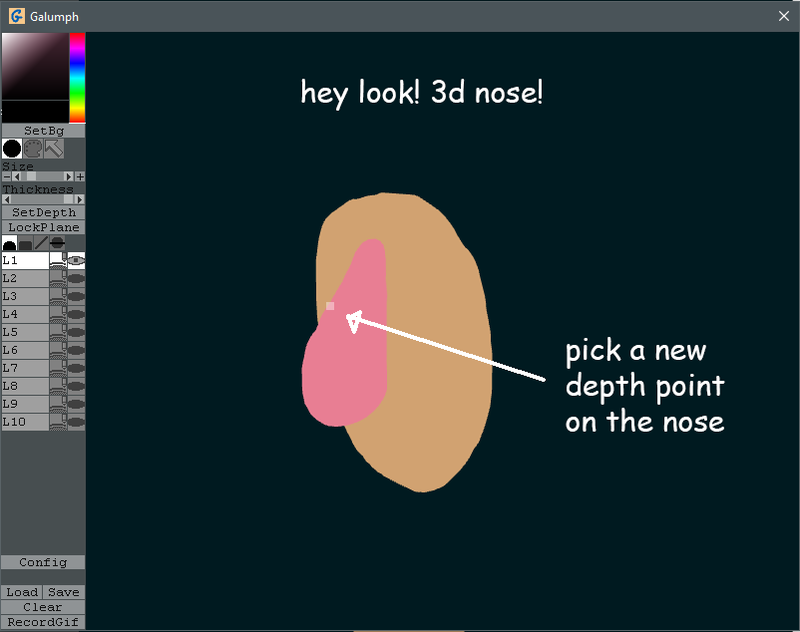 Now click somewhere on your circle where you plan to draw a nose. See that little transparent white dot you just placed somewhere in your circle? That is your depth point. To better understand what a depth point is, lets turn our camera around. Hold Alt on your keyboard, and with the Left mouse button rotate it around so that our circle is now seen from the side. See where you actually placed the depth point in 3d space? Now draw a nose, your strokes will be placed at the depth you just picked before. Left mouse button on that viewport like before, give it your best shot. At this point things usually start making a bit more sense, maybe not quite yet though, but give it a few more minutes. To really understand the depth-drawing concept, lets look at our guy in full 3d glory. Then Alt + Right mouse button to move it around. And Alt + Middle mouse button to zoom in and out. Now pick a depth point somewhere on the nose where you think it'd be a good depth to put some glasses on. 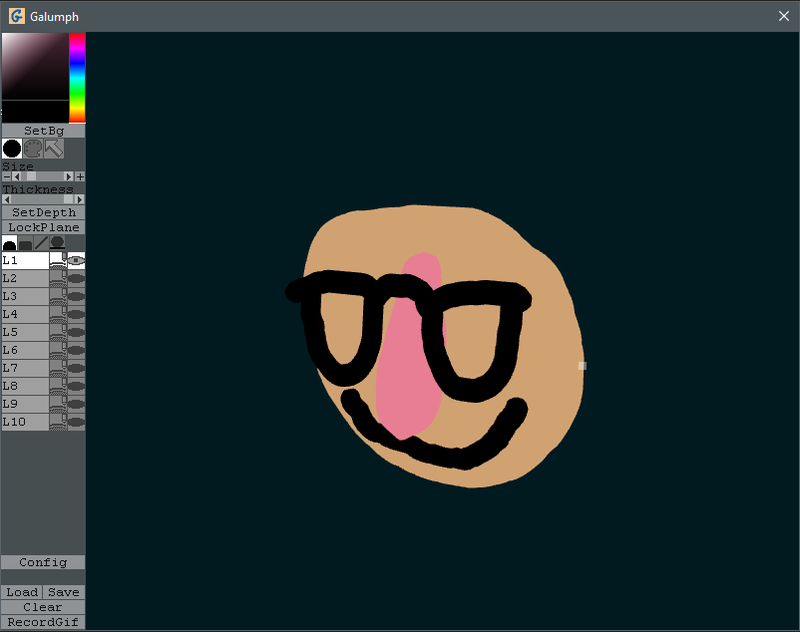 With our depth point set, now rotate the camera to have a nice front view where it makes sense to draw the glasses. As soon as you're done drawing a pair of glasses start rotating the camera again, you might notice your glasses are not perfectly aligned with the plane of the face/circle. 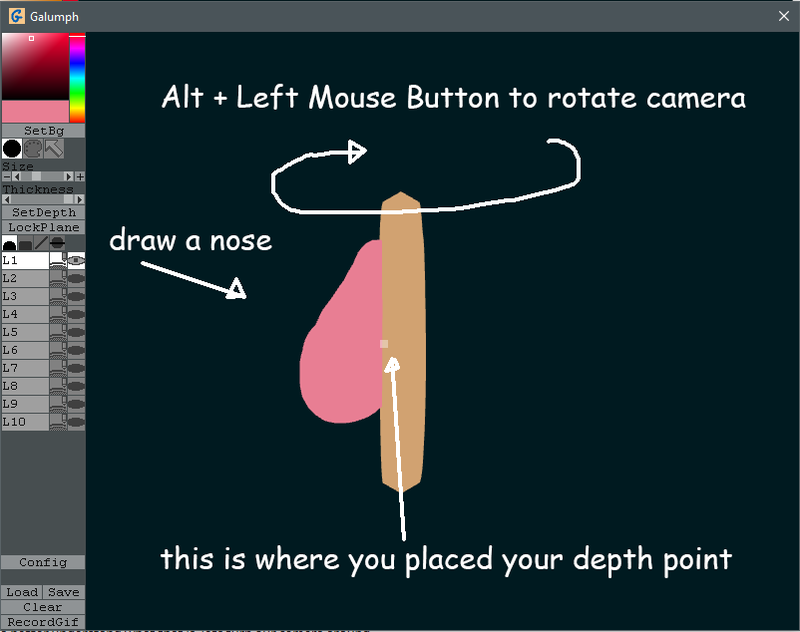 It's one of the quirks of 2d/3d drawing, it's ok, Galumph has some very simple tools to deal with that. Use Ctrl-Z when you do something you do not like. Lets add a mouth, we want to draw that on top of the face (duh! ), without worrying if the camera is perfectly rotated or not. 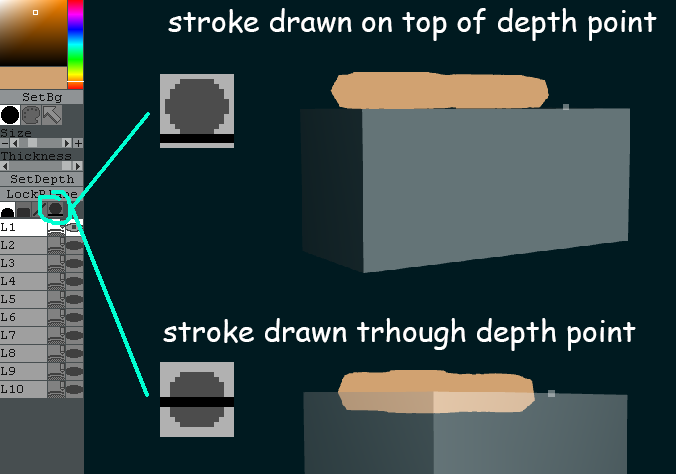 To do that, lets use the 'D' keystroke, it behaves exactly like the SetDepth button but you can keep it pressed down to draw on top of other stuff you've previously drawn. The depth point will be automatically adjusted while you are drawing, it's cool, give it a shot with the mouth! Nice, lets freestyle a bit from there with the stuff we've learned so far. Galumph has a gif capture button at the bottom of the toolbar, but that's not all, you just made a 3d model! Save it, open it in your favorite 3d application that supports fbx import, or just upload it on sketchfab.com and show the world your first galumph sketch! To make some strokes more evident or more blended with others, you have the option to draw on top of the depth point or passing through it. In this tutorial we started our sketch as a 2d circle and went from there. In the next tutorial we'll see what tools we have at our disposal to draw more complex 3-dimensional shapes with finer control over the strokes. A tool to draw 3d models, in 2d. Can't wait, this looks so cool! This is awesome, I'm really looking forward to trying it out.